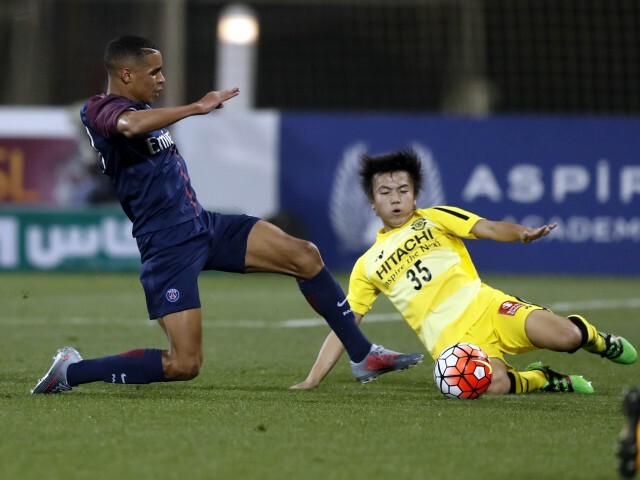 Paris Saint-Germain and Kashiwa Reysol fought out a 1-1 draw in the final group game of Al Kass 2018. Both sides were already assured of reaching the knockout phase after each winning their opening games against Tottenham, to leave the London side with zero points. But the pedigree of both PSG and Kashiwa during previous editions of Al Kass suggested that this match would be treated as far more than just a training session, and so it proved, although the pace was initially rather sedate. Paris Saint-Germain, just 24 hours on from their high energy clash against Spurs, made wholesale changes, with only Curtis Fiawoo and Maxen Kapo surviving from the previous starting 11. Kashiwa, meanwhile, made four changes, with their line-up once again including keeper Leo Kokubo. Incredibly, Al Kass 2018 is the third edition of the tournament that Kokubo has starred in, having first appeared as a 14-year-old in 2016. His reliability has been key to Kashiwa’s strong performances throughout, and once again he was Mr Dependable this evening, reacting smartly to turn aside a rasping, long-range drive from Arnaud Kalimuendo on 20 minutes. It was one of the few shots on target in an opening period where each side was given time to settle. Then, on the half hour, Reysol should have gone in front, Mao Hosoya set off on a determined run through the middle, evading several challenges and attempting to round keeper Yanis Saidani, who just got a hand to the ball. It fell to skipper Keita Ide on the edge of the area, but he blasted narrowly wide with the keeper stranded. Soon after, Kokubo was again Kashiwa’s saviour when he somehow managed to hold on to a rising drive that appeared goalbound. There was nothing between the two sides as the first 45 drew to a close, although PSG had arguably created the better chances. They began to turn the screw as the second half began and, in the 53rd minute, they were ahead. The ball was worked out to the right and crossed low to prompt a goalmouth scramble. For once, Reysol could not clear, and captain Kapo forced the ball home from a few yards out, despite suspicions of offside. Kashiwa were hanging on, repelling a string of PSG attacks with stubborn and courageous defending. But then, on 66 minutes, following a rare foray upfield, Reysol won a corner on the right. A teasing delivery was flicked on by captain Ide, and Hadetoshi Tomita volleyed home at the far post. The equaliser was the catalyst for Kashiwa’s best spell of the match, as they began to attack in numbers and press the PSG backline. The Parisians remained assured throughout, however, and were rarely troubled until the last minute, when Ide could have won it, only to fire over from close range. PSG instantly went on the attack and Tanguy Coulibaly delivered a powerful effort after cutting in from the left that, once again, Kokubo was equal to, sealing his Man of the Match award in the process. The game finished all square, with both sides already looking forward to what promises to be a thrilling knockout phase.